Sally-Ann Wilson is CEO of the Public Media Alliance, http://publicmediaalliance.org the largest global association of public broadcasters. She holds a degree in Development Studies and an MPhil in Cultural Ecology. In 2014 she was awarded an Honorary Doctorate for services to international broadcasting. She began her media career with BBC Radio prior to becoming a TV documentary Producer/Director. 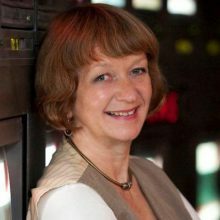 She specialised in documentaries about the environment and development for the BBC and independent sector winning numerous awards for her work. In 2001 she set up WorldView an international documentary scheme that supported more than 500 international documentaries, including 3 Oscar nominated films. In 2010 she was appointed Secretary-General of the Commonwealth Broadcasting Association. In 2014 she led the organisation through a period of transformation to become the globally focused Public Media Alliance. She is course founder of the Masters programme in Media and International Development at UEA in Norwich.